Rewards Canada: Now book Aeroplan award flights through the Aeroplan Mobile App! 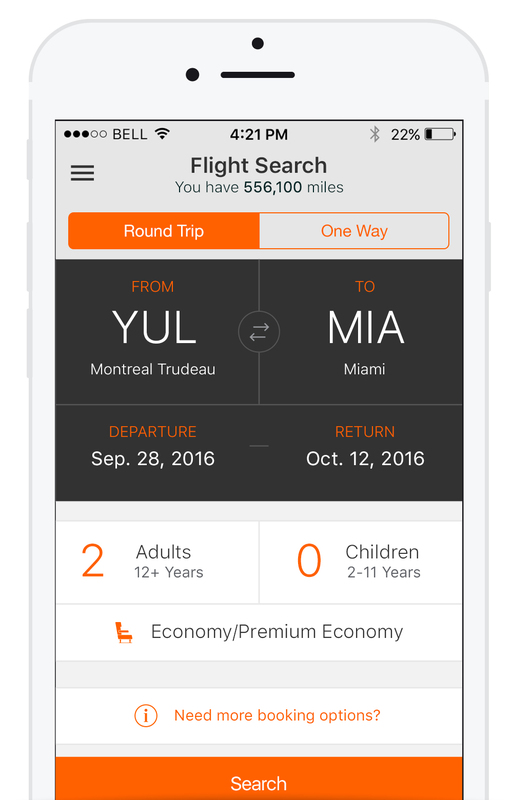 Now book Aeroplan award flights through the Aeroplan Mobile App! Great news from the team at Aeroplan! You can now book your Aeroplan award tickets via their app for iOS, Android and Blackberry! Under the ‘Use Your Miles’ section, select ‘Book a Flight.’ A Flight Rewards search form will appear. Select desired City/Airport location and select date field. Click ‘Done’. A list of potential itineraries will populate show casing both of Aeroplan’s travel options: Fixed Mileage Flight Rewards (limited number of seats exclusively offered to members on Air Canada and Star Alliance) and Market Fare Flight Rewards (access to any seat, at any time, on all Air Canada flights based on market fares at time of booking). After you select a flight, a Trip Summary Page will appear. The member is then prompted to enter passenger details,contact information and payment entry information. I have been waiting for this for sometime as I have wanted to search availability before when the only device I had near me was my phone. This will make that a lot easier now! How about the rest of you? Are you excited about this new addition to the app?